For the most part, no recipes are really needed for homemade baby food. The procedure is pretty simple. Cut food. Steam food. Blend. Feed baby. But here I am posting a recipe for homemade baby food. Even though it’s a simple process, when I first jumped into making Meghan’s food, I was lost. I looked online and bought books dedicated to making baby food at home. Now that I’m doing this for the second time, I’m much more confident. I figured I’d share a recipe here and there for anyone who might be looking to learn about making homemade baby food. It really couldn’t be easier. It doesn’t take long at all and I usually can squeeze in a batch of pureed fruit or vegetables right along with whatever I’m making for breakfast, lunch, or dinner. 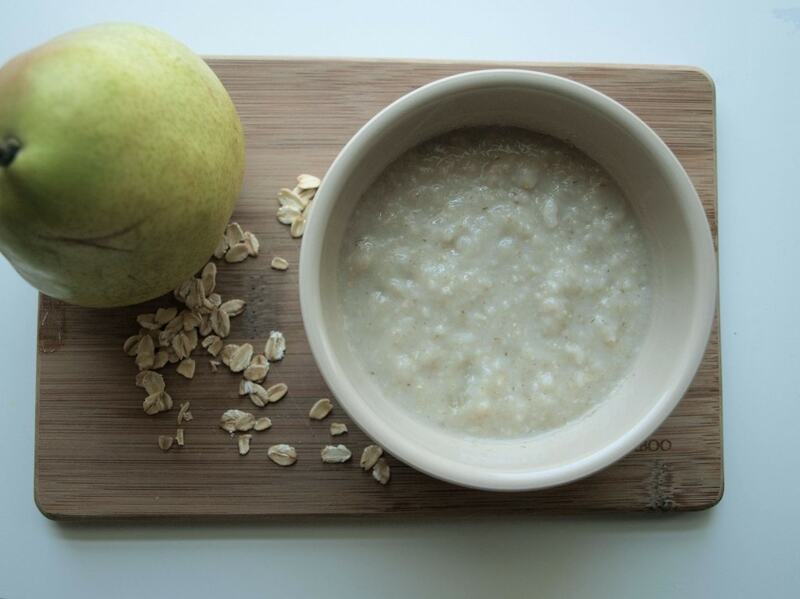 Put the rolled oats, water, and pear chunks into a saucepan over medium high heat. Bring to a boil and allow to gently boil for 5-7 minutes, stirring frequently. Remove from heat and transfer to a blender. Blend until the oatmeal is at your baby’s desired consistency. Older babies can eat it as is without blending. Will keep stored in the refrigerator for 2-3 days. Simply reheat and add some of your baby’s usual milk (or more water) to thin it again. Enjoy! Question: Did you or do you make your baby’s food at home? What was/is his favorite combination? I made my daughters baby food and one of her favorite combos was avocado and mango. I have just started making single purées for my 5 month old son so look forward to your posts on combo recipes. I must say, this time around is much easier as I’m more confident and have since purchased a Vitamix. What a difference! Yes, I love how smooth the Vitamix gets the purees! I’ve found I have to make a big batch to use it, though. It feels like forever ago that we were in the babyfood stage, but it’s only been about 3 years. Time flies? Drags? with little ones underfoot, no? I remember I used to make a pan of oatmeal with apples cooked in. 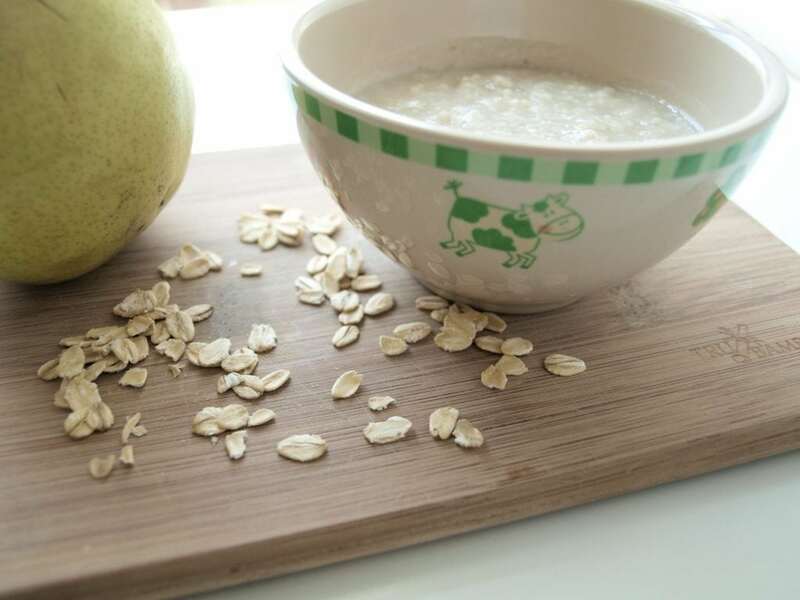 I would take out some of the cooked apples and give them to the baby, give the apple-less oatmeal to my toddler (who for some reason didn’t like apples in her oatmeal) and finally eat the remaining apple oatmeal for my breakfast. Both of my kids ate a lot of bananas and avocadoes. I loved that I could just keep ripe ones on hand and then throw them in my bag whenever we were heading out to mash up on site. That’s exactly right–time flies and drags at the same time! Not sure how that’s possible, but that’s totally how it goes. Avocados have been an early favorite for Luke, too. Nothing beats how easy they are! They are an expensive one, though, as he eats at least 1/2 an avocado at a sitting. I LOVE making baby food. And eating it myself. Nothing beats the consistency of it! I haven’t tried it so I can’t say for sure. Sorry! I do know it will keep in the fridge for a few days. You must try it with rice milk or almond rice milk, which is healthier than regular milk and is a bit sweet and sooo good with the oatmeal! (: I recommend it! I make the same recipe and its really good. I would love to hear about the names of the homemade baby food recipe’s, too! Thank you. That looks so delicious I want to eat it myself! Amazing recipe, my baby loves it. Thanks for sharing. can we use them for 4 months baby? Most doctors say that baby cereal can start at 4 months. You just need to blend it very well.